ZipX makes shopping abroad and shopping online easy! 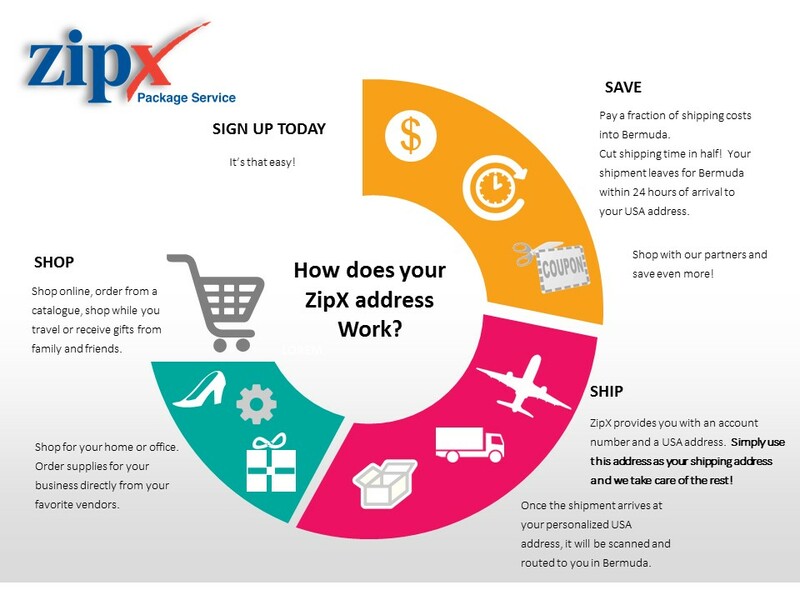 ZipX is a package service that helps you receive online purchases, gifts and mail in Bermuda, all while saving you time and money. The key to our service is a USA shipping address that we give to all of our ZipX members. This makes it easy for members to shop, ship and save! When you sign up for a ZipX account, you receive your own unique membership ID and a USA address. When you shop online, simply enter your USA address and membership ID with your order information. We will coordinate the rest! We even make it easy to return products purchased online. Shop and ship while you travel! As you shop while traveling abroad, use ZipX to ship your purchases home, leaving you without extra baggage and reducing duty charges. Zip Express (ZipX) was launched in 1999 to give Bermuda residents access to products and services often limited to the USA and Canada. Using their own USA shipping address, ZipX members can shop abroad or over the internet and direct their packages with ease and confidence. ZipX takes care of the rest! Our reasonable shipping rates and excellent customer service make shopping overseas easier than ever before! ZipX is a service of International Bonded Couriers, Inc (IBC), Bermuda ’s leading express messenger and courier operation. IBC and ZipX are recognized throughout the world as industry leaders. This accreditation is an indication of the expertise and attention to detail that is available to you.